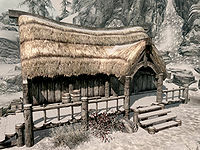 Irgnir's House is the house of Irgnir, located in Dawnstar. It is next to Iron-Breaker Mine, at the end of the path through town, past The White Hall. There is a good view of the bay from the partially covered porch in front of the house, between Brina's house and The Mortar and Pestle. To the left of the main steps up to the porch is a snowberry bush. To the left of the building an area has been fenced in, however apart from a pile of firewood there is nothing in this area. Another single room dwelling. On your left, against the southwest wall is a long wooden table holding a bottle of each, alto wine and wine, a cabbage, several loaves of bread and two boiled creme treats. On the floor to the left is a basket containing three cabbages and another basket to the right contains two leeks and four carrots. To the right of this is a set of shelves holding two leeks, several loaves of bread, two garlic bulbs, three potatoes, two gourds and several cheese wheels. Above there are two garlic braids, three bunches of elves ear and a bunch of frost mirriam. In the western corner and along the northwest wall are three barrels, two of which containing foodstuffs. Further to the right against the same wall is a round wooden table and two chairs. On the table the are six loose coins. Opposite the door on the northeast wall is a fireplace with a cooking pot in front, two bottles of Nord mead on the mantlepiece and three pieces of firewood on the hearth. 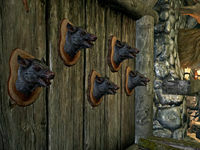 To the left is a pile of firewood with five skeever heads mounted on plaques above. To the left of these is a rack hanging from the ceiling holding three rabbits. To the right of the fireplace is a pickaxe. Further to the right against the northeast wall is a tall wardrobe containing clothes and a chair beside it. Coming out from the southeast wall is a large double bed with two bottle of alto wine on the floor to the left of it, a pair of boots at the foot of the bed and a medium coin purse and chair to the right. There is an unlocked wooden chest against the southwest wall, with two more pickaxe to the right, next to the door. This page was last modified on 11 April 2017, at 04:02.